Sterling silver is an alloy of silver containing 92.5% by mass of silver and 7.5% by mass of other metals, usually copper. The sterling silver standard has a minimum of 925 in continental European terms. 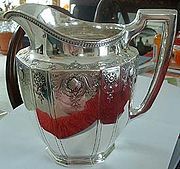 Pure silver, for example 99.9% pure, is generally too soft for making objects for use. Therefore, the silver is usually alloyed with copper to give it strength while keeping the ductility and beauty of the precious metal. Other metals can replace the copper, to improve various properties of the basic sterling alloy such as increasing resistance to tarnish. These replacement metals include germanium, zinc and platinum, as well as a variety of other additives, including silicon and boron. Alloys such as argentium silver have appeared in recent decades. Argentium silver has some germanium added, and resists tarnishing well. The first legal definition of sterling silver appeared in 1275. A statute of Edward I specified that 12 ounces of silver for coinage should contain 11 ounces ​2 1⁄4 pennyweights of silver and ​17 3⁄4 pennyweights of alloy, with 20 pennyweights to the Troy ounce. Sterling silver standards are protected by hallmarks stamped on pieces by officials. ↑ Accounts and Papers of the House of Commons: 1866. II. House of Commons. 23 March 1866. pp. 14–15. OCLC 11900114. This page was last changed on 27 June 2017, at 19:26.